Male peponapis pruinosa — one of the "squash bees." 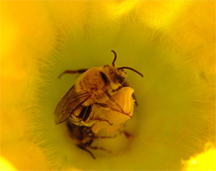 Flowering plants use a variety of strategies to gain the cooperation of pollinators. Their strategies are so effective that they rarely have to deal with "insubordinate non-subordinates." For example, some plants produce two kinds of pollen — one that is involved in cross pollination and a second type that's sterile but which is more appealing to pollinators. Other plants produce a nectar laced with a narcotic to encourage the pollinator to linger at the flower, enhancing the probability of successful pollen transfer. Both of these strategies illustrate a general principal of organizational dynamics: it's easier to stay out of trouble than it is to get out of trouble. To apply this principle to insubordinate non-subordinates would be to recognize that keeping non-subordinates cooperative is easier than winning their cooperation once it has been withdrawn. Keeping non-subordinates cooperative requires an understanding of their motives for not cooperating. Photo by Jim Cane, courtesy U.S. Department of Agriculture Agricultural Research Service Bee Biology and Systematics Lab, reproduced by the U.S. Forest Service. You've been given a responsibility that you can discharge effectively only with sincere cooperation from some people who don't report to you. Perhaps it's an organizational function, or developing a procedure or policy, or supporting a decision process, or any of a number of cross-functional tasks. Typically, people cooperate, but since almost everyone is overloaded, the degree of cooperation varies. Although some people do present problems, most people mean well — they just have too much to do. And then there are the other people. Some are determined not to cooperate. Since they probably don't want to communicate either, we're often unsure why they don't cooperate. Sometimes we interpret non-cooperation as personal. We assume that the issue is one between two people, and that we know exactly who the two people are. If we understand the yearnings and goals of the person who chooses not to cooperate, we can respond more effectively. Here are some typical motivators or yearnings that can lead to non-cooperation, emphasizing individual factors. I'll use C as the name of the person who's championing the effort, and S for the person who's subverting it. When getting attention is S's goal, the question becomes, "Whose attention is being sought?" The true target might be someone higher in the organization than C is, or someone else whose aspirations will be indirectly subverted. can respond more effectivelyC might just be collateral damage. C might not consider revenge as S's motivator if C is unaware of the supposed past offense, or if the true target isn't C. And sometimes C just can't believe that S would engage in such petty behavior. When trying to understand S's motivation, revenge can seem so unsettling as an explanation that C rules it out. C might even feel guilty for thinking about it. But revenge can be very tempting to S, who can often gain revenge simply by doing nothing. Often we assume, with some justification, that people act with intention and with full and accurate understanding of the situation, but it's possible that what appears to be intentional, informed non-cooperation is not that. The behavior in question could be the result of confusion or misinformation. Perhaps S is truly swamped; perhaps S does indeed intend not to cooperate. But perhaps S is also merely confused; perhaps S has been misinformed. That is, if S truly understood the situation, S would cooperate eagerly. Confusion can have multiple dimensions. Consider investigating whether S is confused. Perhaps a private conversation will be enough to sort things out. Would you like to see your comments posted here? rbrenJDwspIDqKdLGoTIhner@ChacqVphApZVOvuzRUDToCanyon.comSend me your comments by email, or by Web form. After the boss commits even a few enormous blunders, some of us conclude that he or she is just incompetent. We begin to worry whether our careers are safe, whether the company is safe, or whether to start looking for another job. Beyond worrying, what else can we do? Often, at work, we make interpretations of the behavior of others. Sometimes we base these interpretations not on actual facts, but on our perceptions of facts. And our perceptions are sometimes erroneous. Even those who aren't great writers do occasionally write clearly, just by chance. But there are some who consistently produce unintelligible email messages. Why does this happen? When organizations know that they've done something they shouldn't have, or they haven't done something they should have, they often try to conceal the bad news. When dealing with whistleblowers, they can be especially ruthless. See also Workplace Politics and Conflict Management for more related articles. I offer email and telephone coaching at both corporate and individual rates. Contact Rick for details at rbrenufwTAEskLaJqULLsner@ChacJkkLkFKNcqFjEsMuoCanyon.com or (650) 787-6475, or toll-free in the continental US at (866) 378-5470. The message of Point Lookout is unique. Help get the message out. Please donate to help keep Point Lookout available for free to everyone. Beware any resource that speaks of "winning" at workplace politics or "defeating" it. You can benefit or not, but there is no score-keeping, and it isn't a game. Some public libraries offer collections. Here's an example from Saskatoon. Is every other day a tense, anxious, angry misery as you watch people around you, who couldn't even think their way through a game of Jacks, win at workplace politics and steal the credit and glory for just about everyone's best work including yours? Read 303 Secrets of Workplace Politics ! My free weekly email newsletter gives concrete tips and suggestions for dealing with the challenging but everyday situations we all face. A Tip a Day arrives by email, or by RSS Feed, each business day. It's 20 to 30 words at most, and gives you a new perspective on the hassles and rewards of work life. Most tips also contain links to related articles. Free!